Beer dispensers have been made from just about all types of refrigerators and freezers over the years. 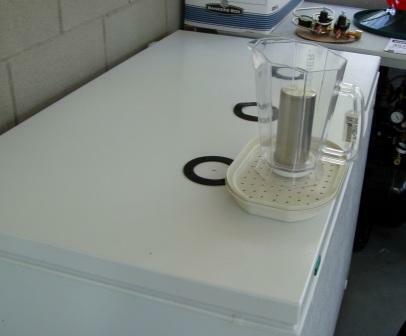 Chest freezers work especially well, particularly when you consider the low cost of some freezers. 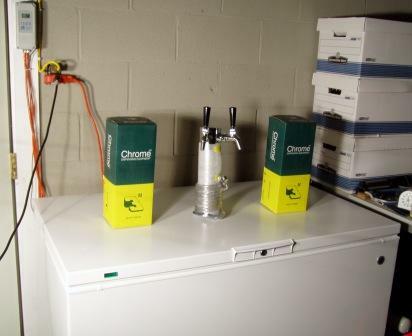 A beer kegerator made from a chest freezer should give you many years of trouble free service. 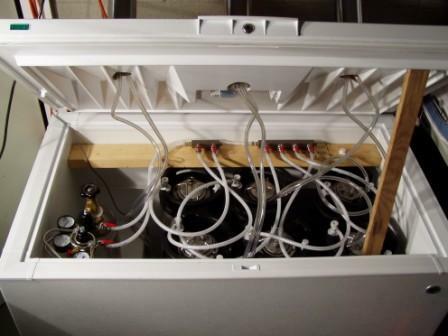 This is a step by step guide to build a kegerator for homebrew beer or soda. A kegerator is a great home project that can be completed in just a few hours. 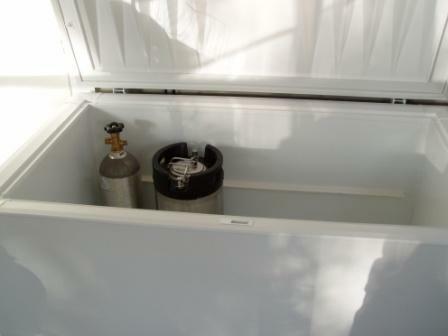 Although these instructions were written for homebrew beer kegerator and Cornelius kegs, the exact same conversion will work draft beer kegs, just be careful when lowering the kegs into the freezer because they can be very heavy. 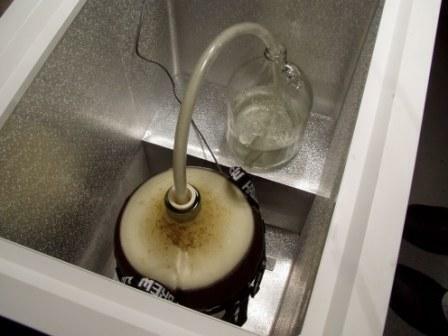 The only difference between this conversion and a draft beer conversion is that a kegerator conversion for draft kegs will use keg couplers instead of the soda type disconnects shown in the pictures. The freezer needs to be large enough to hold the number of kegs you want to dispense from and the dimensions can be deceiving. The easiest way to measure chest freezers is to cut out a set of cardboard disks the size of your kegs and then to lay them in the floor of the kegs you are looking at. The inside needs to be at least 25.5" high. 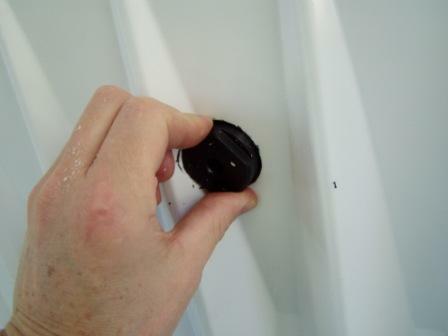 A shorter chest freezer will work but you will need to build a wooden collar to lift the lid up a little. These photos are of a friend's conversion in Mobile, AL. These instructions will guide you through converting a chest freezer a completely self contained kegerator for homebrew beer. Here's a picture of the "victim" before the conversion. Before starting your conversion, verify that the freezer is deep enough for your kegs. 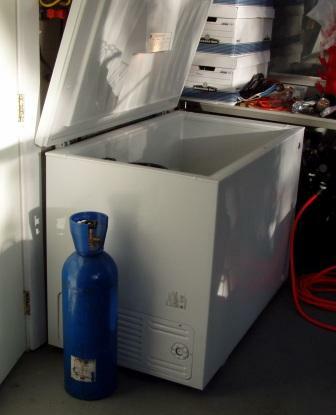 This one is fine, with enough room for the kegs and enough room to place a 5# CO2 tank on the compressor shelf. 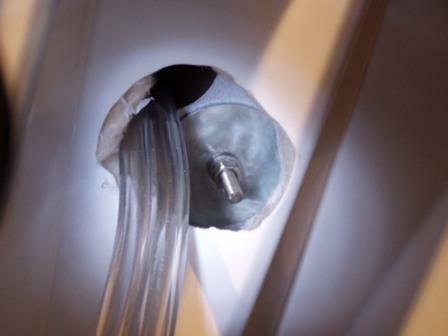 If the freezer is not deep enough then you will need to remove the lid, build a collar out of 2X4's or 2X6's and then mount the lid into the collar. All modern freezers will have a compressor shelf. This one is all the way across one side but some are just in the corner. The compressor shelf will take up quite a lot of space in some freezers and you need to consider the shelf when choosing your freezer. It's much better to measure chest freezers at the store with a set of cardboard disks that you cut out to the size of your kegs. You can just lay the disks on the freezer floor and you'll know right away if it's big enough for your needs. Start your conversion by deciding where you want to place the beer tower or beer towers. KC decided to install three beer towers. Notice the small grey box in the top, left corner? It's a Ranco controller. Ranco controllers are used to over-ride the freezer's internal thermostat so that you have cold beer instead of frozen beer. You can find my temperature controllers here. KC used the actual base gaskets as guides. KC also planned to use Polar Pitchers serve his beer, plus he found some low cost trays that a local discount store will make great drip trays. He adjusted the base gaskets a little foreword so that the trays he found would sit right at the front edge of the freezer lid. This is just his personal preference - the towers could have been installed dead center or towards the rear of the freezer lid. Once you are happy with the alignment, drill the center holes. KC decided to use a hole punch to cut the holes in the door. This is the cleanest way to cut the holes but you can also use a hole saw or drill a series of small holes if you don't have or can't find a hole punch. 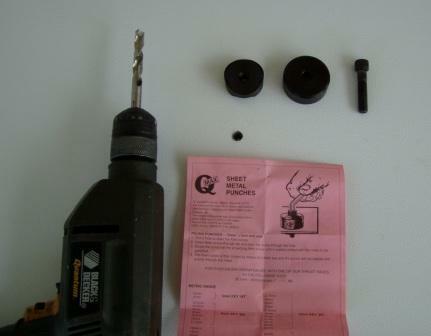 This is a picture of all of the hole punch parts laying beside one of the center holes he drilled earlier. 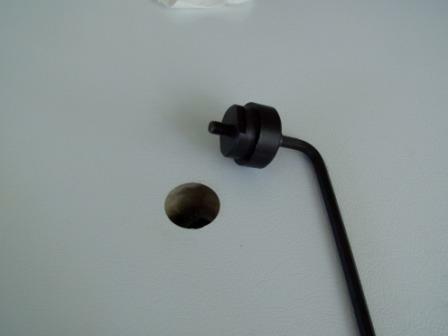 Hole punches are available from your electrical supply place and are available in a variety of sizes. Once everything is assembled, you just tighten the screw and let the die do the hard work. This is a good picture of the die being drawn in from the bottom. Once the steel has been cut all the way through, the entire hole punch just pops out leaving a nice clean round hole. Then you just unscrew the die set, pry out the metal plug and start over with the next one. 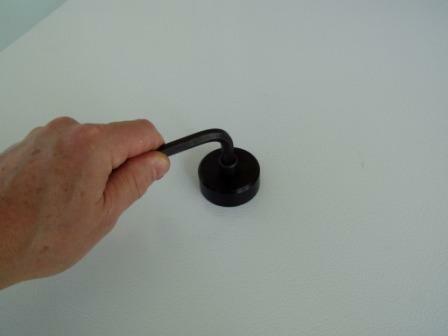 Beer towers come with very long mounting screws, intended to be mounted through a wooden bar. KC decided to replace his with shorter mounting screws - you'll see why later. The only problem with converting a chest freezer into a kegerator is that the steel is thin and does not have a lot of strength. Because of this, you need to reinforce the lid. 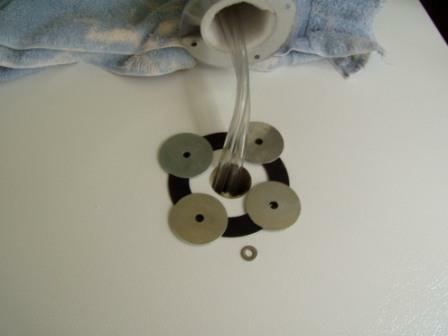 KC chose a set of fender washers and he has them placed here to make sure that they don't get in the way of the center hole. 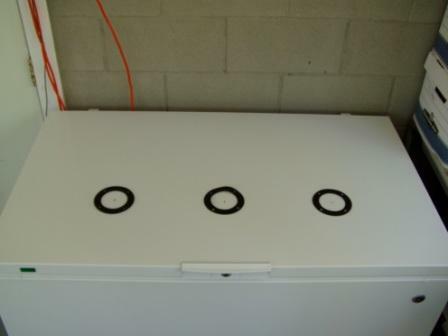 KC used the fender washers and the shorter screws to mount the beer towers and he had to cut away some of the plastic liner to be able to place the fender washers directly against the inside surface of the freezer lid.. 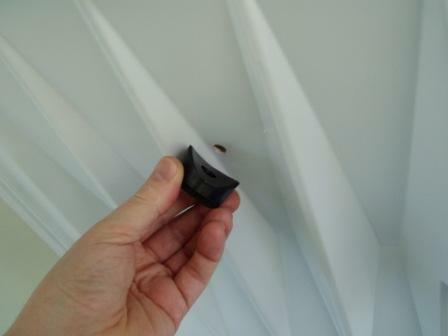 This is a picture of one installed, with three to go. 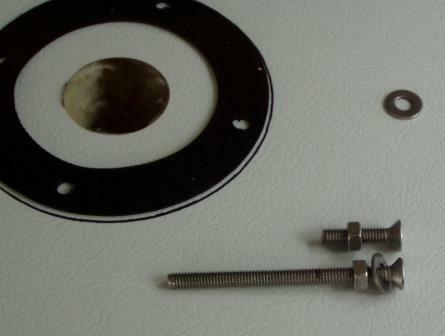 You can also place a short piece of 1X6 shelving on the inside with a large hole drilled in the center & 4 matching mounting holes drilled around the large hole. Then you can mount the towers with the original hardware, sandwiching the freezer lid between the beer tower and the piece of 2X6. Here's a picture of the complete kegerator. The unique looking beer faucets are stainless steel Perlick Foreword Sealing Faucets. Here's a great picture of the inside of the finished kegerator. Notice that the beer lines (the clear lines) look very long. Beer towers come standard with 5' beer lines and they need to be kept at this length to help control foaming. And another great picture from the front. KC chose to use a 2 pressure regulator (left side) so that he can run two different pressures. The two bars in the back with small red handles are a 2 port and a 4 port CO2 manifold. One regulator output runs to each manifold then a line runs from each manifold to a keg. He has the ability to run 2 different pressures with this system and can apply one pressure to 4 kegs and the other pressure to 2 kegs. A 2 pressure regulator really comes in handy for fast carbonating a keg while still serving from others or for setting unique pressures for more carbonated beers like a wheat.